The Weld-Mask from Miller provides a new, innovative approach to getting into tight spaces, but it doesn’t integrate a hard hat. 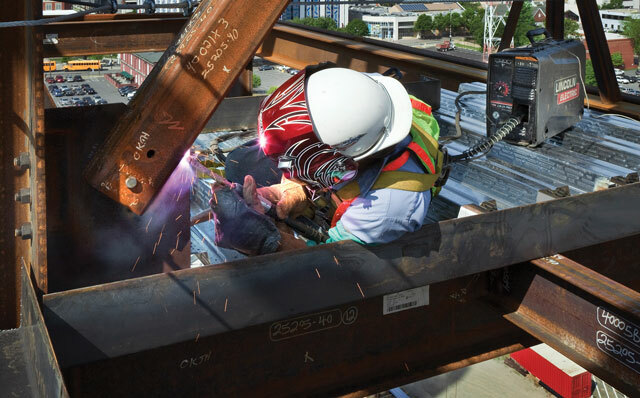 Welders on construction sites are covered head to toe in personal protective equipment (PPE), often looking like superheroes out of comic books — and some of the helmets have the graphic designs to match. While they might look badass, the reality is that PPE can be heavy, it can be hot and it takes a physical toll on the person wearing it. If we’re also being honest: The marriage of welding helmets to hard hats on construction sites has not always been particularly easy, convenient or well executed. Manufacturers have made strides here to improve functionality, weight, balance and the product itself. New partnerships have also developed in the face of updated regulations that require accessory providers — in this case welding helmet manufacturers — to prove that their product does not adversely affect the performance of the hard hat. OEMs have succeeded at this — today’s helmets can weigh less than half of what they did 10 to 15 years ago — and they’ve also focused on ways to ensure workers spend a greater portion of their day completely protected. To Harvey’s point, welding helmets (and other PPE such as jackets and gloves) only protect the user when they’re worn, and many workers are notorious for shedding PPE at the earliest possible moment. The more work functions an employee can successfully and comfortably complete while wearing a single piece of protection/apparel ensures optimal use and minimal exposure to elements on a jobsite. It also cuts down on the varied pieces of PPE a welder must keep on hand, which adds simplicity and reduces additional clutter around a jobsite. 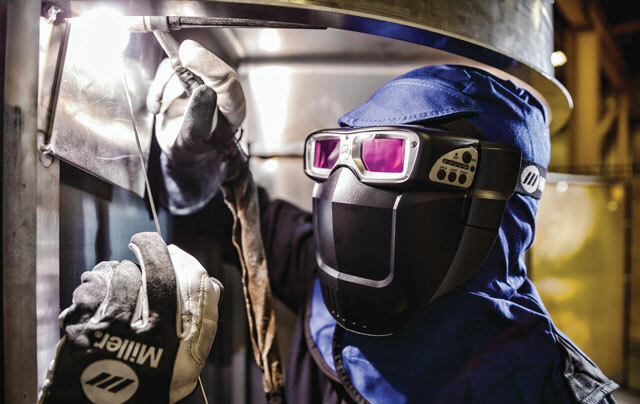 Welding manufacturers Miller and ESAB similarly offer selectable modes in their helmets that allow for supporting work activities such as cutting and grinding. Miller takes it a step further by incorporating a flip-up element to its T94i helmet that exposes a 44-sq-in. clear viewing area for grinding and other tasks that require clear visibility. The greater functionality of each helmet, and the ability to customize it to numerous tasks on the jobsite, is changing buyers’ perspectives from bulk-buying one-size-fits-all solutions to specifically selecting products best suited — in comfort and function — to each application. “[Contractors are] transitioning more from a minimal compliance standpoint towards focusing more on operator comfort and productivity,” says Miller’s Harvey. Manufacturers are also encouraging improved weld quality by changing the composition of the auto-darkening lenses found in today’s helmets. Manufacturers are also encouraging improved weld quality by changing the composition of the auto-darkening lenses found in today’s helmets. Each uses different names and implements different variations, but the general idea is the same: greater clarity and visibility to the weld puddle. Miller’s ClearLight Lens Technology is designed to optimize clarity in both welding and light states. Lincoln’s 4C Lens Technology (which borrows the cut, clarity, carat and color mantra from the diamond industry) has a perfect 1/1/1/1 EN 379 Optical Clarity rating and does away with the traditional green shading of an auto-darkening lens as it uses a blue hue. Today’s helmets also come with next-generation technology such as Miller’s InfoTrack that allows the welder to track the total arc-on time and number of arcs struck throughout the course of the day — a quantifiable measurement of productivity that could satisfy both general curiosity and employer demands. Lincoln’s Rutti sees the trend of more advanced technologies being incorporated into helmets continuing and ultimately taking functionality to the next level. A major focus of welding PPE suppliers is the integration of hard hats with welding helmets and the resulting weight and balance. Welding eye/helmet protection takes different forms on every site. There are powered air purifying respirators (PAPRs) available that integrate with most major manufacturers’ helmets. Miller has come up with a new product, called the Weld-Mask, that essentially features an auto-darkening set of goggles, a face mask and a flame-resistant head sock that allows access into tight areas where traditional helmets may not fit (hard hats aren’t required — although a hard hat could be worn over the sock). But the most common combination on construction sites today revolves around hard hats and welding helmets and how they are integrated with one another. All manufacturers make a variety of adapters and adjustment options to work with hard hats, but new rules place greater liabilities on those manufacturers. “There are recent changes to ANSI [American National Standards Institute] regulations for hard hats, where it puts the onus on the manufacturer of the accessory to prove that the accessory doesn’t negatively impact the hard hat itself,” according to Harvey. 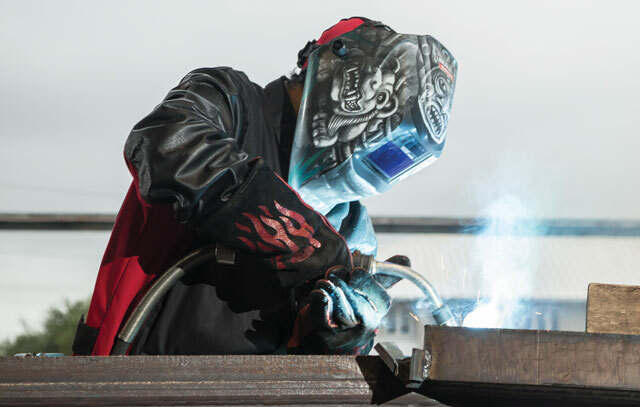 The benefit to the industry is that manufacturers of both welding helmets and hard hats have gotten together to test and provide solutions guaranteed to work together efficiently and ensure optimal protection — all within compliance. Miller and MSA Safety, for instance, have produced a line of fully compatible hard hats and helmets (auto darkening and passive) that can be purchased as a package through MSA to give employees and contractors the peace of mind that they’re working with a fully compliant solution.